Would you believe that the Australian capital, Canberra means women’s breasts? Why is it that Canberra means women’s breasts? Is it just a sort of odd colloquialism that only Aussies would understand or is there another, more realistic and logical answer for this peculiar meaning? When you first read the title of this fact what did you think? Bad attempt at being funny. or WTF is going on down there? Well we can tell you that it really, really does mean that, even though it goes against the long held belief that it means “meeting place” in the local aboriginal language. So how did it all go so wrong? Canberra is unique to all other cities in Australia, being completely planned in design from the outset. It’s a relatively new city, with the design of the city being awarded to Chicago architects Walter Burley and Marion Mahony Griffin in 1911, with work beginning in 1913. Until it was completed the temporary seat of government, bu not the capital was in Melbourne. This was part of the compromise for the location of the new capital. At the time Melbourne and Sydney were the largest cities (still are today), and both wanted to be the new nations capital. As a compromise Canberra was chosen as the location provided that it was at least 100 miles from Sydney, and Melbourne was the seat of government until the new city was ready. But what about that name? New city new name, right? Canberra as a word came from Kambera or Canberry which comes from the old Ngunnawal language of the local Aboriginal people. It was chosen because it was supposed to mean “meeting place,” which is certainly suitable for the seat of government. However…. Oopsy daisy, there was a little mistake in the translation. 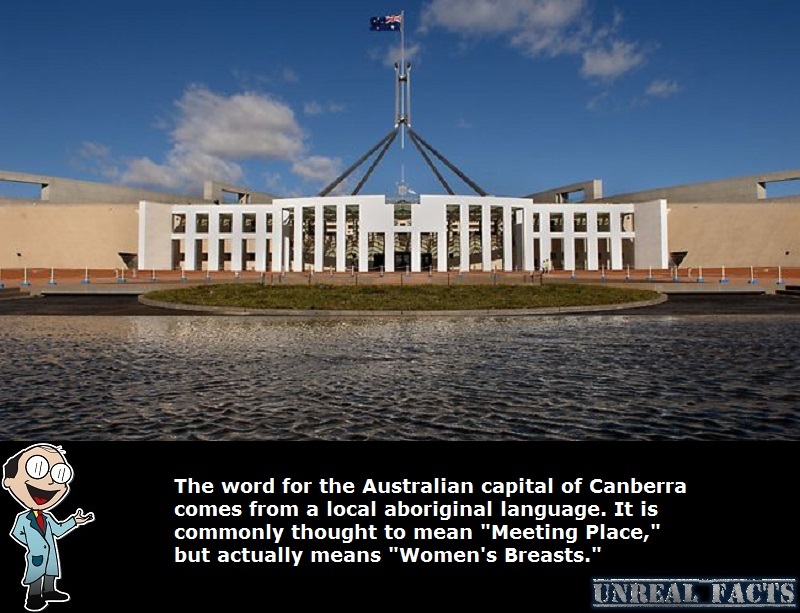 According to Ngunnawal Elder, Don Bell, Canberra means women’s breasts. This comes from the Ngunnawal name for the two opposing mountains nearby, Black Mountain and Mount Ainslie, which when combined form an image of breasts. Even though Don Bell passed away in 2008, and was not alive at the time the new capital was named, he had a strong spiritual and cultural connection with his ancestry, language and land. This is further supported by a letter to the editor of the Canberra Times in 1939 that stated the very same.